Virginia Mercado, a graduate of Aquinas Literacy Center, speaks from the heart after being awarded the Sister Claudia Hinds Scholarship. On Thursday, June 16, Aquinas Literacy Center (ALC) held its annual Student Awards Celebration. Nine adult learners were celebrated for their graduation from Aquinas’ English as a Second Language (ESL) program. Virginia Mercado, one of the graduates, was awarded the Sister Claudia Hinds Scholarship. Each year ALC awards the scholarship to a graduate who goes above and beyond the average student. The scholarship was created in memory of Sister Claudia Hinds, the Adrian Dominican Sister who founded ALC. Scholarship funds are used to further the student’s education in English. 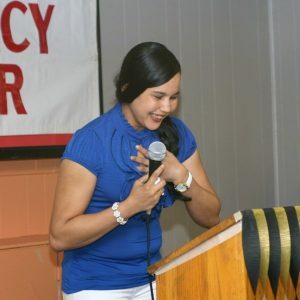 While dedicating herself to learning English, Virginia volunteered as ALC’s Spanish Literacy Instructor, helping Aquinas’ lowest level learners transition to English instruction. In early 2016, Virginia also offered a workshop to her peers about taking advantage of the resources at ALC. Virginia will use the scholarship to take ESL classes at Arturo Velasquez Institute. For 20 years, Aquinas Literacy Center has served the immigrant community by offering free, individualized instruction in the English language. For more information, call (773) 927-0512 or email info@aquinasliteracycenter.org.